I had mentioned deciding to build a floor-standing hand tool cabinet based on a Shaker Step-Back Cupboard from Popular Woodworking, in a previous blog post. Cherry was my wood of choice, but at seven feet tall and forty-two inches wide by sixteen inches deep, when I priced American Cherry locally for my cabinet, it quickly became prohibitive for my budget. 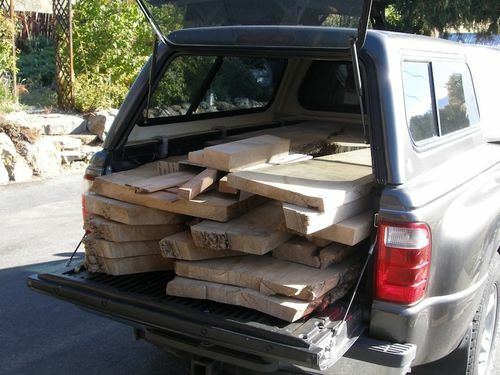 Fortune smiled on me when I contacted a fellow 150 miles away who had a stash of Elm he was willing to part with for a reasonable fee, and last weekend we drove a pick up over to load it all up. I’m excited about this wood, as he’d done a desk with it and put on an oil finish that gave it a rich, honey-gold appearance. This was the Biggest wood purchase I’ve ever made! I have all winter to play with it and dress all the pieces. Pretty exciting! Wow, that is some wonderful looking wood. and THICK too. Not sure if that is one piece or two on the right but that almost looks book matched and would be awesome for your cabinet doors. Congratulations on the purchase. Looking forward to the finished product. Looks like a beautiful find. Sounds like a good deal. That’s two book matched cuts on the right. The center slab, third fromthe left, is actually an ‘extra’ he offered me of Silver Maple. I may do the cabinet door faces from this maple, framed by the Elm. The finishing contrast should prove interesting! I’ll do a test sample first, of the combination. 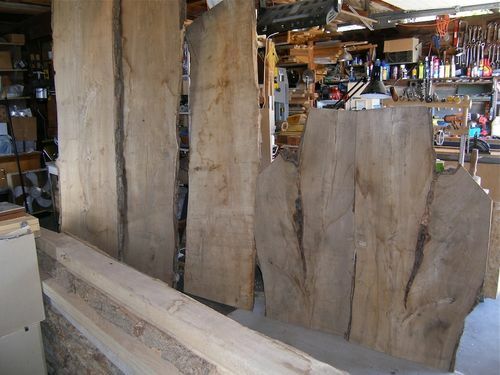 The tall Elm slabs on the left are also 8/4, so they would do for the door faces, too, resawn and bookmatched. Wow! You got a load there. Your going to be busy! I looks like you got some really nice wood there Barb. How many hand tools ya got there Barb? That’s a whole pile a lumber! Looking forward to seeing what comes next. Best of luck. Thanks guys. and, Chrisstef, I have enough hand tools to fill up a cabinet! 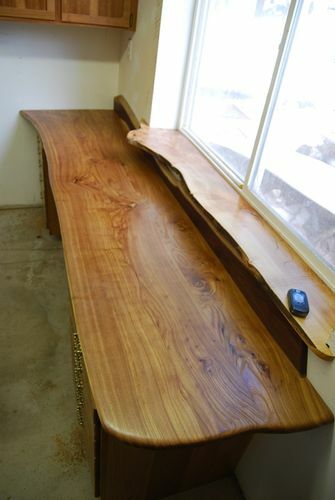 Here’s a photo of this Elm finished with oil (I think BLO) and a light poly top coat. Made by mike1950, a new LJ member. it’s from the same tree he sold me the wood from, and this photo is what made me want this Elm! Now this is going to be a great project, I am excited for you and looking forward to following your build. Nice Haul, Beautiful Wood !! that’s a good haul. I made my bench top out of elm. You will be pleased with it I’m sure. That’s a beautiful bench, Don. Thanks for showing that. It is great that you are happy with the wood Barb- hope to see it in the future-slightly altered. Wow Barb! ... I can’t wait to see this lovely wood ‘all dressed up’ and put to good use!! Nice haul Barb, looking forward to seeing the progress. Since this is a cabinet for hand tools, does this mean your using mostly hand tools for the construction? ?